Powerful: With a peak current of 800 Amps, the GOOLOO GP180 has enough power to jump start vehicles (up to 7.0L Gas or 5.5L diesel), Motorcycles , RV, tractor, light-duty trucks, mower, cargo vans, ATVs, snowmobiles, oil boat, yachting multiple times on a single charge. Recharge USB Devices: Dual USB out port can be used to charge virtually any USB powered device, such as smartphones tablets, GPS, camera, kindle and more. Advanced Protection Circuitry: The intelligent protector is built in the battery pack, and protects from fire which can cause melting or explosion. Ultra Bright LED Flashlight: Built-in LED flashlight, SOS and strobe light, can help you in any case especially for adventure, outdoor, daily, emergency, travel. 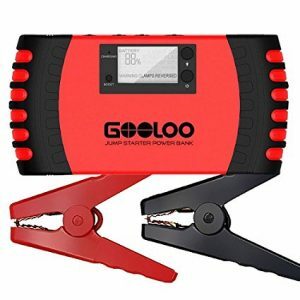 What You Get: GOOLOO Jump Starter GP180, 12V Battery Clamp, Wall Charger (With UL Certification ), Car Charger, 3 in1 USB Cable, Storage Case, User Manual (P.S. Not include 12V cigarette lighter socket adaptor ). We offer 12 + 6 month extended warranty & 30 days money back and 24/7 friendly customer service, welcome customers to contact us at any time.